Patience…. comes in a small pot! I’d never ridden tubs before I got onto the track. My time on a bike has matched the evolution of standard high pressure tyres. From the original Michelin Hi Lite and Vittoria Corsa CX to their modern equivalents. Standard tyres have always been good enough and are almost foolproof. They are convenient, light, reliable and feel good on the road. For track however, the ability to ride out a puncture at the top of the banking has a certain appeal, so tubs it is! The amazing technological advances of road bikes have largely passed the track by. A solid frame, pedals and a bomb proof set of wheels are all you need. Many of us ride random selections of Bitsa bikes and it can be fascinating spotting where everything comes from. On this front E-bay has definitely been my friend. 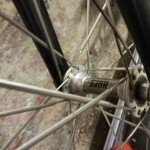 I’m running an old Madison Team stem, an ancient Pete Matthews time trial front wheel (complete with a pencil thin original Hope hub and 24 bladed spokes). 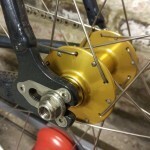 The rear wheel, that’s been receiving some attention this week came from Julian Ramsbottom, featuring a gold Hope track hub and a hefty deep section aluminium rim. So whereas a puncture on a normal tyre means a couple of minutes with a new inner tube and away you go. With tubs it means buying a whole new tub, then investing in the patient game of ‘preparation’. 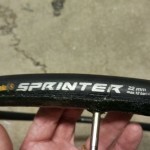 The first day I stretch the tyre out, then mount it on the rim and inflate to 150 PSI and leave overnight. Time at that pressure gradually relaxes the tyre, making it ready to mount for real. Then I need to thoroughly clean the rim. 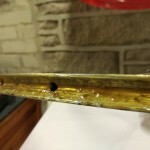 Any loose bits of the old glue etc are scraped off. Acetone completes the cleaning process and I’m ready to start glueing. 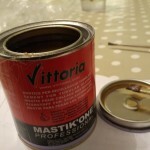 For this I need my trusty pot of Mastik One. This is great stuff! It sticks the tub so solidly to the rim that at the fun side of 30 MPH, on a 42 degree banking, I don’t have to think twice! The last tub had become so attached that it actually got ripped apart in removing it from the rim!! So on the second day of the ‘preparation’ process, I apply a really thin, even coat of glue to the tub’s base tape and the rim. When it comes to glue, tub and rim are good, clothes are definitely not! So an apron ( and no distractions) are the best way. Day three means another thin layer of glue and yet more time waiting. Day four is the last coat and once this is just going tacky I’m ready to mount the tyre. Fortunately this goes OK and I’m not left frantically trying to push the last few gluey inches onto the rim. There is room for a little adjustment, just to get it perfectly centred and even, and to roll and press out the wheel, just to make sure everything is seated nicely. Finally it’s all pumped to 150 PSI and left overnight, just to make sure it’s fully set. Five days later and I’m finally ready to ride! All I’ve got to do now is make sure the chain is plenty tight enough and then wipe the tub down with white vinegar to remove any dirt, dust or debris so that it will grip properly on the track. The whole process is like a ritual, readying the bike over a far longer period of time than simply popping in a new inner tube. The patience taken to ready the bike is similar to that which is readying my body (finally) to get riding again. The daily ritual of stretching (and newly introduced strength work), needs to be followed. It is a long term process that will in the end have me back to full strength and on the road. The process needs to be followed carefully. Daily additions are the way forward, just nudging the process on a little at a time. With the recent scandals, ranging from Rob being chemically enhanced towards national time trial fame to the Belgian cyclocross rider Femke Van Den Driessche riding the world championships with a motor onboard, it can be reassuring to go back to older ways. 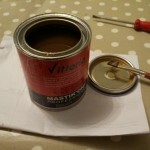 The time and patience spent gluing a tub, a reminder of the time and patience taken to cultivate good form. In cycling, as in life there are no shortcuts only interesting routes.